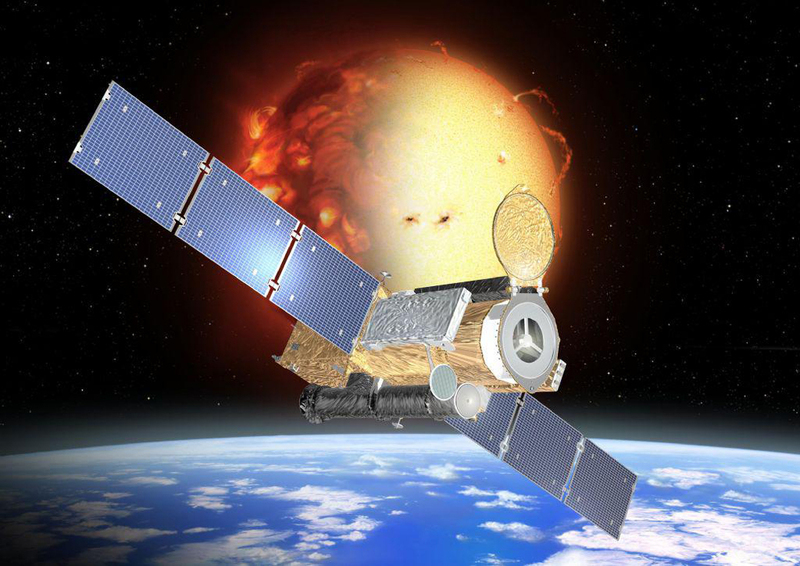 Since its launch on Sept. 22, 2006, Hinode, a joint mission of the Japan Aerospace Exploration Agency (JAXA) and NASA, has been watching the sun nearly non-stop, providing valuable insight into our star – and others throughout the universe. Hinode has captured everything from solar explosions to the delicate motion of solar spicules, allowing scientists to study these phenomena in great detail. As most of Hinode’s instruments are still in good working order, the team behind Hinode hopes to delve even deeper into our nearest star. To celebrate Hinode’s first 10 years in orbit, here are 10 highlights from Hinode’s scientific accomplishments of the past decade. This image of Venus was taken during the Venus transit of June 5, 2012, by Hinode’s Solar Optical Telescope. In this image, Venus is just beginning its journey across the face of the sun. Its atmosphere is visible as a thin, glowing border on the upper left of the planet. Scientists used images from the Venus transit, taken by Hinode and other sun-watching satellites, to study the atmosphere of Venus. These images of the moon eclipsing the sun on May 12, 2012, coincided with a simultaneous annular eclipse visible from parts of the western United States and Southeast Asia. An annular eclipse happens when the moon passes directly in front of the sun at a point in its orbit when it is relatively far from Earth. This extra distance makes the moon appear smaller than the sun in the sky, so it doesn’t block the entire face of the sun, instead leaving a thin glowing band – often known as a ring of fire – around its edge. Hinode’s Solar Optical Telescope imaged the sun’s chromosphere – a thin layer between the sun’s surface and atmosphere – on Jan. 12, 2007. This image showcases the filament structure of solar material that is pulled and stretched by the sun’s complex and ever-changing magnetic forces. This footage from Hinode’s X-ray Telescope is a composite of nearly two months of images, from Aug. 17, 2013, to Oct. 4, 2013. The bright spots near the center of the disk are active regions, areas of concentrated magnetic field that are prone to eruptions like solar flares and coronal mass ejections. These images were captured near the maximum activity phase of the sun’s 11-year cycle, a period during which active regions are concentrated near the sun’s equator. Hinode captured this image of Comet Lovejoy – seen here as an orange streak in the lower left of the frame – with its Solar Optical Telescope on Dec. 16, 2011. Comet Lovejoy is a large member of the Kreutz family of comets, a group of comets that often pass extremely close to the sun. Comet Lovejoy is rare in that it survived its trip around the sun, emerging intact on the other side. Hinode caught this view of a solar explosion on Aug.1, 2014. This explosion was set off by unstable magnetic fields on the sun’s surface. The footage was captured by Hinode’s X-ray Telescope. Though X-rays are typically invisible to our eyes, they are colorized here in orange for easy viewing. Hinode’s Solar Optical Telescope took this close-up of a solar filament on Oct. 19, 2013. Filaments are huge ribbons of relatively cool material that thread through the sun’s atmosphere, called the corona. Scientists used this image and others from Hinode to learn more about how solar material is heated in the corona. What happens to a sunspot during a solar flare? Hinode helped answer that question with this view of a flare taken by its Solar Optical Telescope on Dec. 13, 2006, just a few months after launch. The bright threads of solar materials visible over the sunspots helped scientists deduce how sunspots and solar flares are linked. Hinode’s Solar Optical Telescope captured this footage of the sun’s limb. The thread-like structures – which somewhat resemble grass waving in the wind – are spicules, giant plumes of gas that transfer energy through the sun’s various regions. This close-up from Hinode’s Solar Optical Telescope shows convection cells on the surface of the sun. Convection is one way that the sun transports energy from its depths up to the surface, where it’s emitted as light and heat.